Each binder ring consists two loose leaf half rings. These two loose leaf half rings combined together with strong metal rivet. Binder rings are much more easier to open or close than regular split key ring. 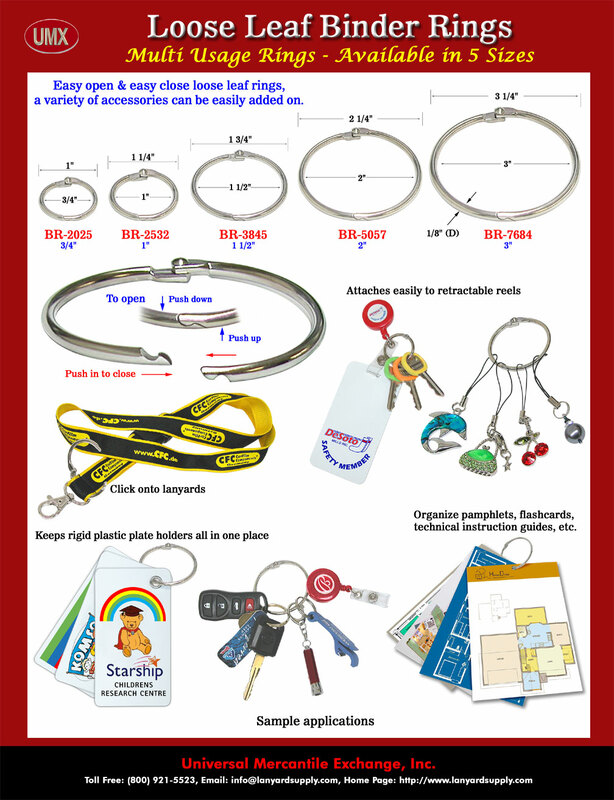 A variety of accessories, booklets, pamphlets, instruction guides, plastic plate cards, flashcards or key chains can be combined together by binder ring easily. Binder rings are commonly used to bind loose flash cards or booklets, so sometimes they are called book rings too. They can be hang in our lanyards or retractable reels easily too. We keep as small as 1" and as large as 2 1/4" outside diameter metal binder rings in stock for instant shipment. If you are looking for smaller or larger size models, please give us a call, we will do custom order from our factory for you. Binder rings can hold multiple sheet of documents, invoices, secure swatches, flash cards, or plates together easily. Binder rings are designed for multiple purpose with two loose lease combined together with snaps for easy to open and close. The heavy duty round metal binder rings can be hang in convenient spot easily. The flexibility and multifunctional binding features make binder rings widely used to bind together a lot of different accessories, If you have special project need a custom size, custom design or custom color binder ring, please call for detail. You are viewing Lanyard > Making > Metal Binder Ring or Loose Leaf Ring Binder For Binding Book, Instruction Guide, Plastic Plate, Paper Card or Keychain easily.